Honey, We Shrunk The Couch! This past week we were able to save an interior designer in a jam. A new sleeper sofa was ordered and delivered to a client in a new home. Except there was one problem. The sofa was too big for the stairs! We began by removing the sleeper unit and then the material. This delicate task of removing the material and padding needed to be done extremely carefully since it would be reused. We then disassemble part of the frame and cut the arm. 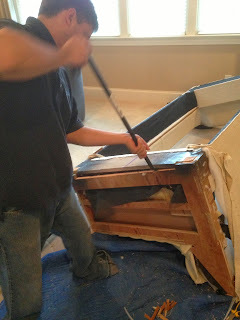 The first attempt up the stairway was a bust and an additional section of the sofa frame needed to be removed. Finally after 5 hours the dismantled frame was on the third floor. After several more hours the material was reapplied and we claimed a successful day! 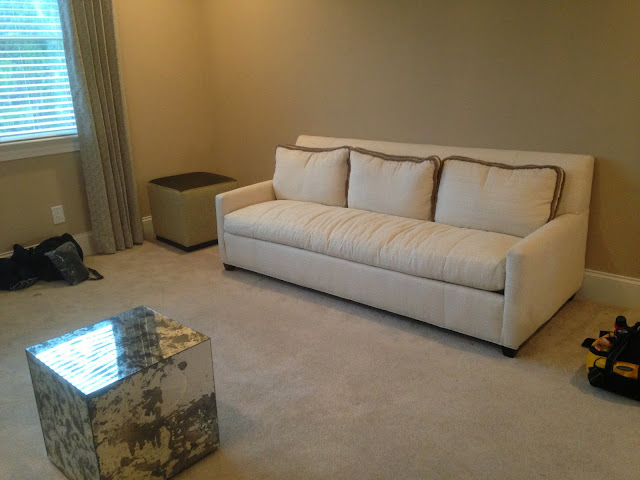 Do you have a piece of furniture that doesn't have a place in your home in it's current condition? Or maybe a friend or relative has a well-made piece that is great structually but not your colors. 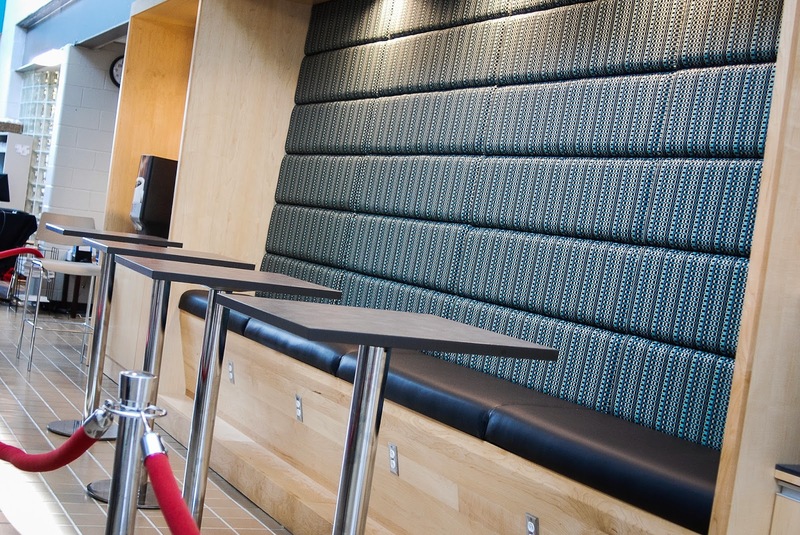 Consider repurposing that furniture for a whole new look! 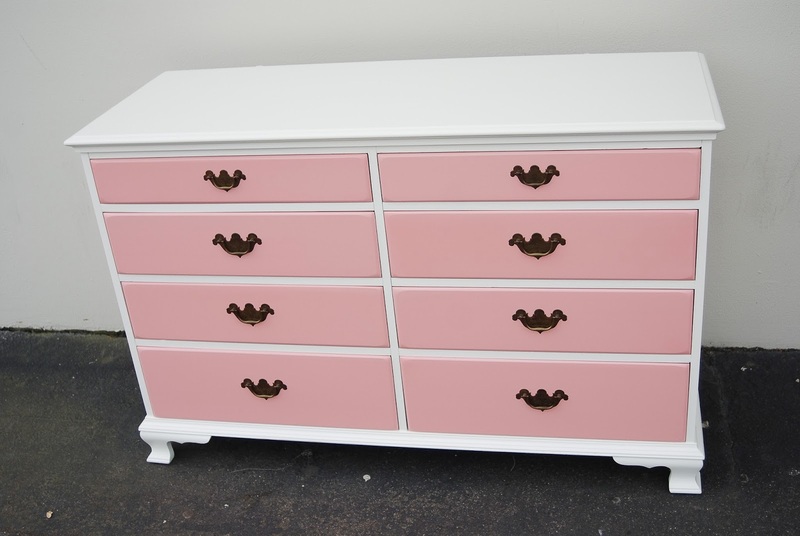 This dresser was an old mahogany piece that we refinished and painted for a customer's young daughter. The history behind this piece is priceless; it's a dresser that has been in her family for generations.... and the tradition continues with her daughter. one of the big furniture showrooms to buy something shiny and new? It comes down to quality. The American furniture industry has been outsourced to...well, a country far, far away. last a lifetime and then some. opposed to picking from the limited selection of a showroom floor. amount of money that would buy you something low-quality. The logic is all there: if you have a quality sofa, reupholster. We get a lot of questions about what we can do to help prevent stains or wear on fabric. There is a few different options ranging in price. The first and most common, and easiest, option is to have us fabric treat your pieces before we deliver them. We apply 3-4 coats of a fabric treatment over your pieces and let it dry for about 24 hours. This helps any stains from setting in. While it will not fully prevent any stains it will help if any liquid or dirt is spilled on the piece. Another option would be to have the fabric back. This process does not protect the fabric against any stains but it does allow it to last longer. Usually this isn’t needed but if a light weight fabric is selected then it might be something to look in to. 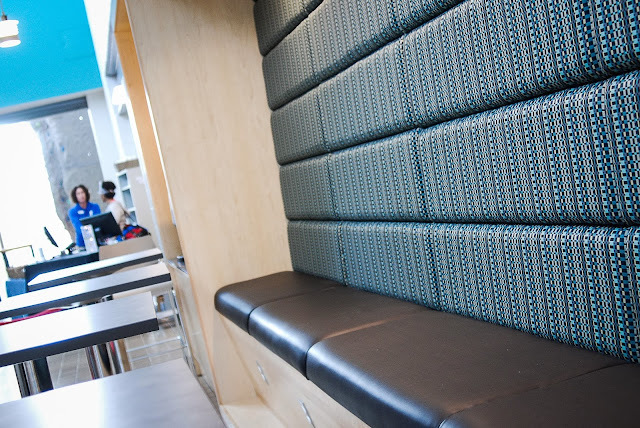 The most expensive and labor intensive option is to have the fabric coated in vinyl. This is a great option for a lake house, near a pool or a kitchen table. About one half of our fabrics can be coated in a vinyl which allows you to still have a great color fabric but it will be mostly water proof. The holidays are upon us, which often means extra entertaining and dinner parties. We thought it would be a great time to offer some reminders about preventative care for your furniture so that your food is served hot and your table remains beautiful. Question: I am hosting a dinner party for 30 guests but worry about people setting hot food down on my recently refinished dining room table. What's the best way to protect the table but still have it look nice? The short answer to this question is raised trivets and/or a table pad with a festive table cloth. 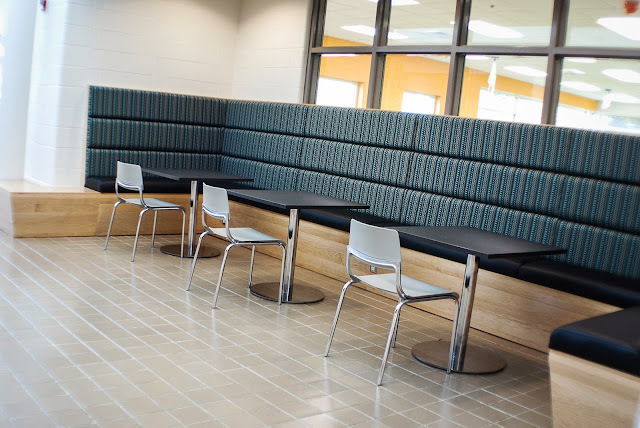 If the table is properly maintained throughout the year (see this link here for care instructions), it will help tremendously in preserving the finish on the table. If for some reason a guest or relative places a hot food item on your beloved dining room table without protection, Finish Pros has published a video here to demonstrate how to get rid of heat rings. 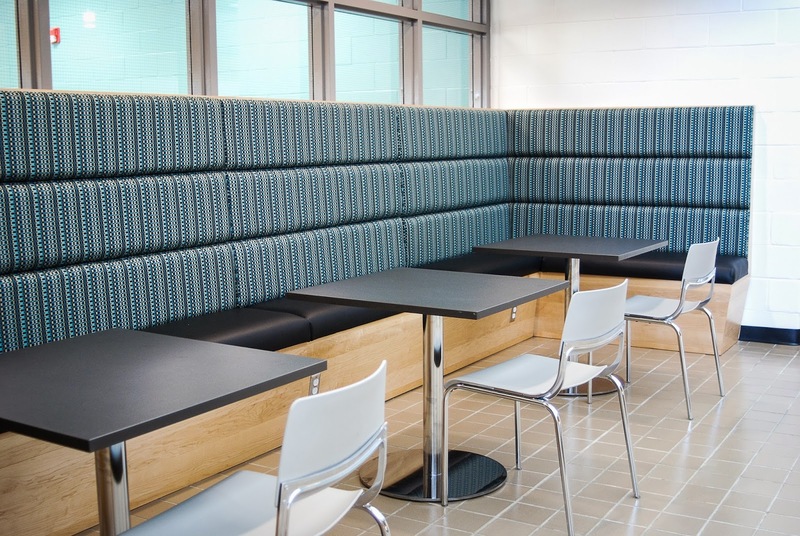 Finish Pros was recently asked to create some custom seating for our local YMCA. 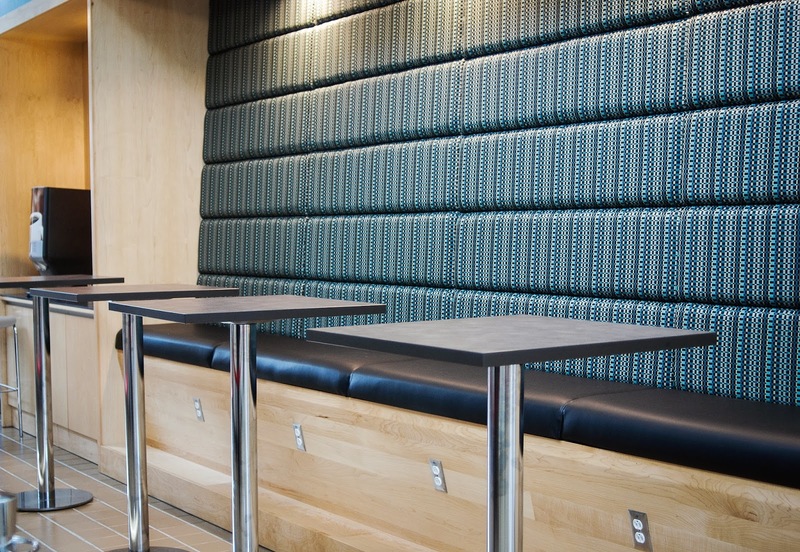 As part of their MAJOR renovation, Finish Pros was able to design and install leather bottom cushions with an upholstered back. Take a look at the finished product! 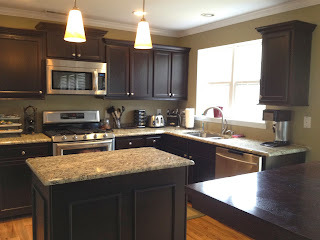 As customers review options to upgrade their kitchen, they often look at either tearing out the old cabinetry or refinishing old dated cabinets. The effort and expense of removing old cabinetry is quickly realized once the estimates arrive. This is why many of our customers have chosen to refinish their cabinets. Most cabinets are made with woods that are easily refinished, so why go through a major renovation that can take weeks or longer. Refinishing is relatively straight forward with everything staying intact, including appliances. And yes, you can even use your kitchen during the process! It all begins with reviewing your current cabinets and providing a door sample with your desired color. Cabinetry is stripped and refinished, which allows for a variety of wood tone colors or as example a paint color to be used such as White or Bone. All the cabinets are custom colored, so if glazing is also desired that can easily be achieved. Once the color is selected, your doors and drawers are picked up and brought back to our facility to be stripped and colored to your specifications. While these doors and drawers are at the shop, a crew will work onsite to prepare your kitchen so that the face frames and side panels can be colored the same as your doors and drawers. The onsite activities typically are around 2-3 days depending on the size of the kitchen or if any millwork will be added. To enhance the kitchen, many customers like to add crown molding or light rail to the cabinetry, or even add solid wood raised panels to the end panels of cabinets. Once the onsite work is completed, we bring back your doors and drawers and install them using existing or new hardware in usually about a half day. So with a new color and potential new upgrades like crown molding and hardware, your kitchen will look beautiful without the high costs of cabinet replacement!